Delivering a nuclear strike is only the first phase of a mission. Next comes the most important part: hightailing it out of there before the entire area turns to glass. And for crews aboard America's first supersonic bomber, getting the heck out of Dodge was done at twice the speed of sound. Developed for the US Air Force's Strategic Air Command in the 1960's, the Convair B-58 Hustler was America's first operational Mach 2 (1,320 MPH+) jet bomber. It was also one of the first USAF aircraft to employ a true delta wing design, as it lacked a horizontal stabilizer. The Hustler, as its name implies, was built for high speeds at high altitudes. As such, it was actually about 20 feet shorter with a wingspan only half as wide as the B-47 Stratojet medium bomber it was meant to replace. 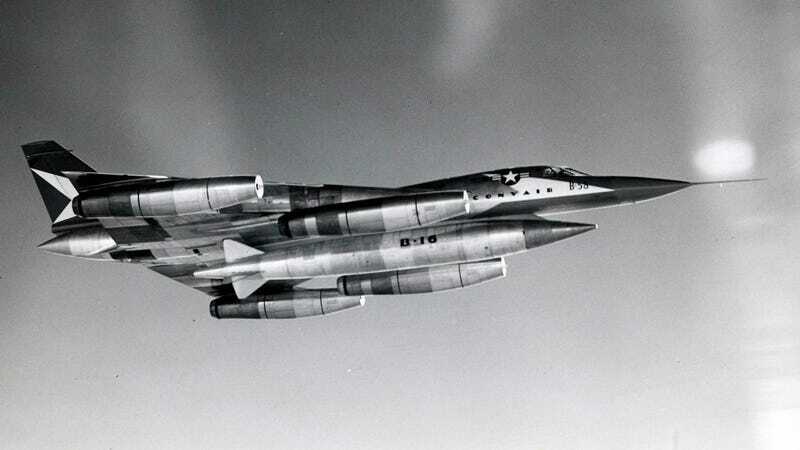 However, with a quartet of wing-mounted General Electric J79 engines providing a (sonic) booming 60,000 pounds of thrust, the B-58 could cruise along at more than 600 MPH at heights reaching more than 63,000 feet with a maximum speed of more than twice that of sound itself. This would theoretically allow the Hustler—and its precious nuclear-tipped cargo stowed under the fuselage—to fly higher and faster than an intercepting MiGs the Soviet's could muster.